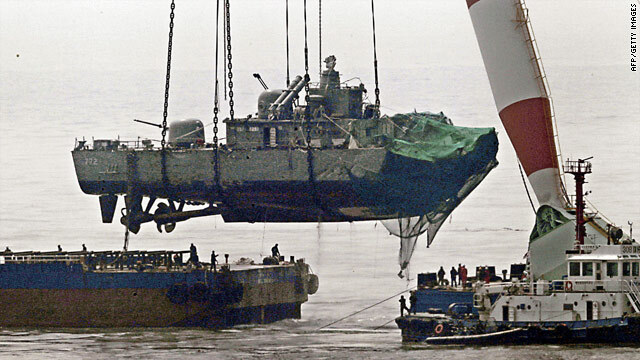 Will South Korea blame the North for sinking warship? Seoul, South Korea (CNN) -- As South Korea awaits the results of a probe into the sinking of a warship, expected to be made public Thursday, debate is already underway over the policy options open to Seoul if the investigation holds North Korea responsible. The Cheonan sank the evening of March 26 following a mysterious explosion that blew her in half. Forty-six sailors were lost as the 1,200-ton vessel went down near disputed waters in the Yellow Sea. Seoul has convened a multinational team -- including American, Australian, British and Swedish as well as South Korean members -- to investigate the cause of the disaster. Their findings will be revealed to reporters Wednesday, and the committee will announce its findings Thursday. In the weeks preceding the announcement of the results, however, speculation on the cause of the tragedy has been rampant. After both ends of the hull were raised from the seabed and the damage seen, an internal explosion was ruled out. South Korean defense officials, after stating that a mine might have been responsible, have named a non-contact torpedo as the most likely cause. Press reports in South Korea, citing unidentified official sources, have stated that fragments of such a weapon and traces of explosive have been found, while some people with sources in North Korea claim Pyongyang's military carried out the attack with a midget submarine. If Seoul does pin the blame on Pyongyang, its avenues of retaliation are restricted. "We are in the realm of no good policy options," said Dan Pinkston, head of the International Crisis Group's Seoul office. "But we have to do something." Central Seoul's landmark Cheongyecheon plaza was a sea of camouflage last Friday, as several thousand retired veterans -- wearing the patches of South Korea's fiercest military units -- rallied to demand an unequivocal response to the Cheonan incident. "We need a strong strike!" growled Han Chun-hee, 64, a Vietnam veteran of marine special forces. "We have to resist North Korea!" Cooler heads, however, consider military retaliation -- such as naval or air strikes on North Korea's west coast naval bases or command installations -- unlikely and inadvisable. "I think if there is clear evidence of North Korean involvement, (the) South Korean government has the right to a military response," said Baek Sung-joo, a senior analyst at the Korea Institute of Defense Analysis. "But that does not mean it will conduct retaliation." A counterattack could spark a vortex of escalation with a state which has artillery targeting Seoul and which possesses an unknown number of nuclear devices. Regardless of the combined South Korean and U.S. superiority in conventional forces, the risk is widely believed to be too high. "Military retaliation is off the table," said Kim Byung-ki, a security expert at Korea University. "We have the capability to wipe them out as a nation-state -- but the only certainty about war is uncertainty and uncontrollability, and with nuclear weapons, that makes it even worse." The Cheonan incident, while shocking, is not the deadliest attack since the conclusion of the 1950-1953 Korean War -- which ended with an armistice, not a peace treaty. A terrorist bombing of a South Korean airliner by North Korean agents killed 115 people in 1987. In 1968, 68 people were killed after a North Korean commando platoon attempted to storm the South Korean presidential mansion, sparking a firefight and manhunt. No military retaliation was launched after those attacks. However, there are other ways to pressure Pyongyang in the military sphere. An increase in defense spending to procure early warning and anti-submarine equipment looks likely, and conservatives have called for Seoul to indefinitely delay the transfer of operational control of forces on the peninsula from U.S. to South Korean command, scheduled for 2012. South Korea could also take a full role in the U.S.-led Proliferation Security Initiative, under which ships suspected of carrying weapons of mass destruction are boarded on the high seas, Pinkston suggested. On the diplomatic front, South Korea may refer its evidence to the United Nations Security Council. "It is a wise move to internationalize this because I think this incident is an act of war. It goes beyond the previous clashes on the maritime border that could be considered misunderstandings or provocations," said Mike Breen, Seoul-based author of "The Koreans." It is appropriate to go to the Security Council." However, while this move might win South Korea international sympathy, experts expect little traction: North Korea is already heavily sanctioned following its second nuclear test, and close ally China holds a security council veto. "The South Korean government does not expect a lot to be accomplished through the U.N. Security Council," Pinkston said. In what may be an early sign of Chinese reluctance to see steps taken against North Korea, which Beijing considers a buffer state on its northeastern border, Korean media reported Tuesday that Chinese ambassador to Seoul Zhang Zinshen had, as yet, seen "no solid evidence" proving North Korean involvement. A more promising avenue could be economic retaliation. Despite their prickly relations, there is considerable commerce between the two Koreas, says Choi Jin-wook of the Korea Institute of National Unification. This encompasses the Kaesong Industrial Complex in North Korea -- where northern labor, under the management of South Korean firms, assembles low-tech products -- as well as "process on commission" assembly work in other parts of North Korea and trade. Few experts expect the Kaesong complex to shut down. Not only is it the last remaining symbol of a decade of engagement with the north, it is the only significant South Korean commercial bridgehead in a country which many South Koreans fear is becoming an economic colony of China. "Once we close it, it is closed forever," said Choi. "That would be very difficult to decide." There is another reason to keep Kaesong operating: its potential influence on North Korean workers. "My view is that the project should continue," said Pinkston. "I think it is subversive in North Korea and it will contribute to the undermining of their system." Official moves to cut the monetary supply are already under way. On Monday, Seoul's Unification Ministry announced that it had told 10 government bodies that deal with North Korea to cease government-level payments. On the private front, South Korea runs a trade deficit with North Korea -- largely thanks to imports of specialized seafood and rare mushrooms -- meaning a cutoff would hurt, Choi said. "North-South commerce totals about $1.8 billion (U.S.) per year," he said. "Kaesong accounts for $800 million, but North Korea can only bank labor payments -- about $50 million. More important is commercial trade; it totals about $350 million, and North Korea banks about $200 million in surplus." A further possibility is for Seoul to ask the European Union to freeze financial assets believed to be held by North Korea in European banks, Pinkston said. (iv) Reopening the propaganda war? Beyond the classic triad of military, diplomatic and economic retaliation, more creative possibilities exist. "Our response should include measures North Korea most dislikes, such as providing outside information to North Korea on a systematic basis," said KIDA's Baek. "This could be a policy shift." The two Koreas agreed to halt official cross-border propaganda in 2004, but private South Korean activists have infuriated Pyongyang by floating balloons, with anti-regime messages attached, northward over the border fences.